The English Crown had claimed overlordship of Scotland but not until 1296 did Edward I attempt to enforce this, leading to several notable engagements. Initially the English were successful invaders but were then repulsed by William Wallace at Stirling Bridge in 1297. In the reign of Edward II, Robert the Bruce inflicted another defeat on the English at Bannockburn in 1314. The Scots took advantage of the weak rule of Edward II to harry the English Border. The depredations of the Scots were brought to an end in 1346 at the battle of Neville’s Cross, where the English captured the Scots King David. The advent of the Black Death in 1348 also assisted the temporary decline in cross border raiding. 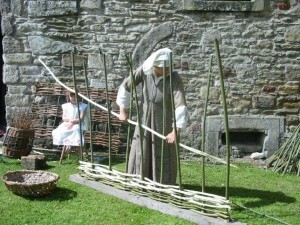 These stirring events in the North are reflected in alterations to the late C13th construction of Aydon Castle, an English Heritage property to the north of Corbridge where Rent A Peasant are frequently invited to appear. The 650th anniversary of the Battle of Neville’s Cross in 1996 was one of the stimuli that led to the formation of Rent A Peasant. 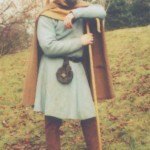 This time period provides a clear contrast at large, multi period or generic Medieval events with the earlier Anglo-Saxon and Norman societies and later, high status, fifteenth century groups. This option is principally in demand for public events at standing ancient monuments and Medieval Fairs. It is also of interest at Middle School history level and, for several years, we have presented the topic at the Keep in Newcastle upon Tyne,shepherd – click to view in new window using the standing building to illustrate the life style of the lower echelons of the hierarchy. The fourteenth century also saw the creation of the Luttrell Psalter, man dressed in Medieval costumeadorned with scenes of rural life in Lincolnshire that illustrate the fundamental importance of the productivity of the land to Sir Geoffrey Luttrell, who commissioned the book. This work is a continuing inspiration to Rent A Peasant. For example, one of our male costumes is loosely based on the ploughman’s attire and the depiction of a four horned ram complements our own sheep. Various economic factors contributed to an increase in sheep walk at the expense of desmesne arable. 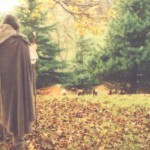 The shepherd was an essential peasant at this time. 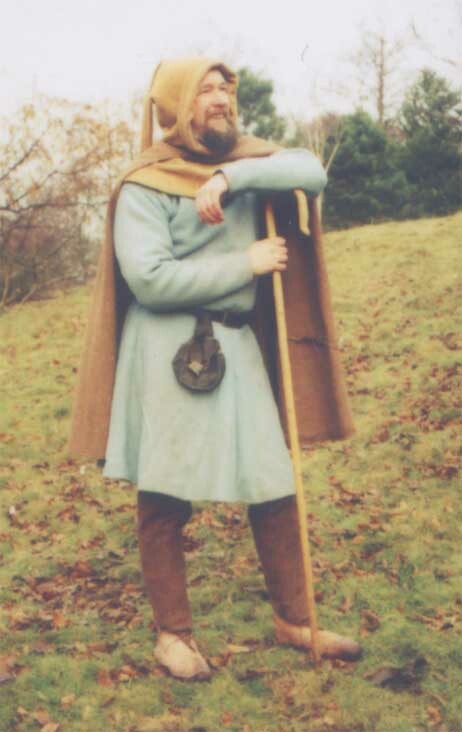 One outfit, modelled here by a Rent A Peasant shepherd, has been totally hand made using the patterns made by Eva Lundwall and Margareta Nockert of the clothes found on a bog body from Bocksten in Sweden. 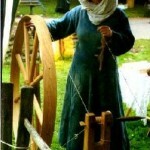 Complementing the increased production of wool was the use of the Great Wheel, Great Wheel – click to view in new windowin addition to the drop spindle, to process fibre into yarn, again illustrated in the Luttrell Psalter as an inevitable female occupation. The designs of the women’s Rent A Peasant garments are based on the extant finds from Herjolfsnes in Greenland.